This beautiful boy is my favorite pet. 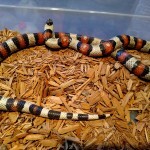 He is a cross breed between a Pueblan Milk snake and a Banana California king snake. 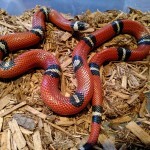 I use him very sparingly to produce some amazing “designer” snakes for pets. You could say he is my pet project. 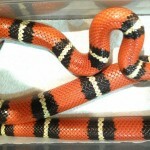 This is Nigel.He has a very interesting pattern that we hope to work with in the future.